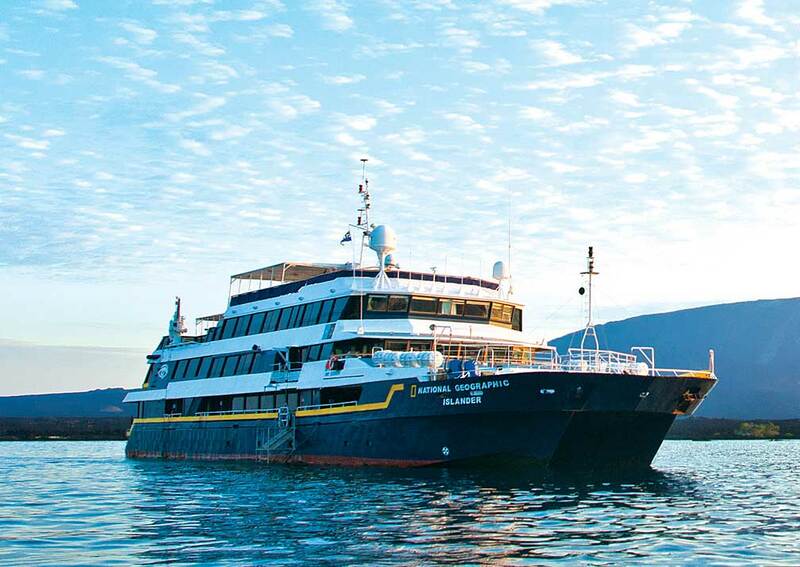 Cruise the Galapagos aboard this comfortable small ship, enjoying land and water-based activities led by expert guides, and the many onboard facilities. 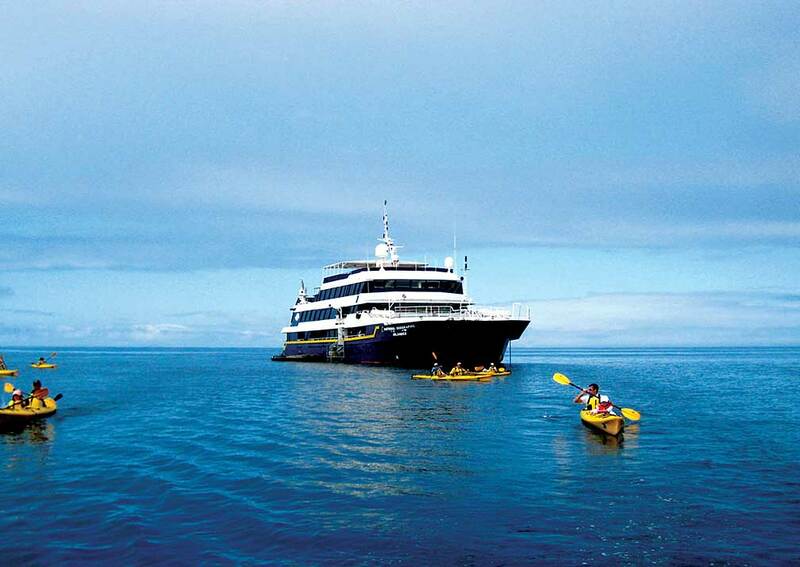 National Geographic Islander is a small cruise ship which has been cruising in the Galapagos since 2004. 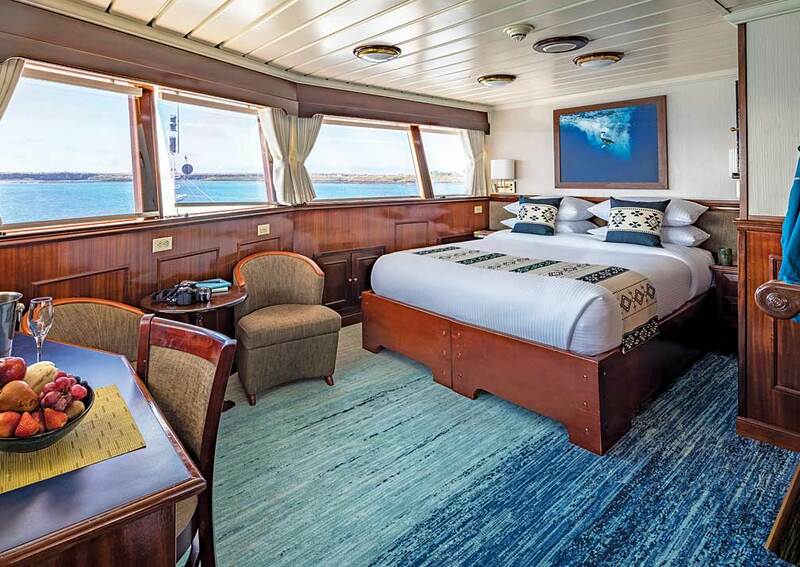 She accommodates a maximum of 48 passengers in roomy outside cabins arranged over 3 decks, all with en-suite bathrooms. Upper cabins are the most spacious and have individual terraces. 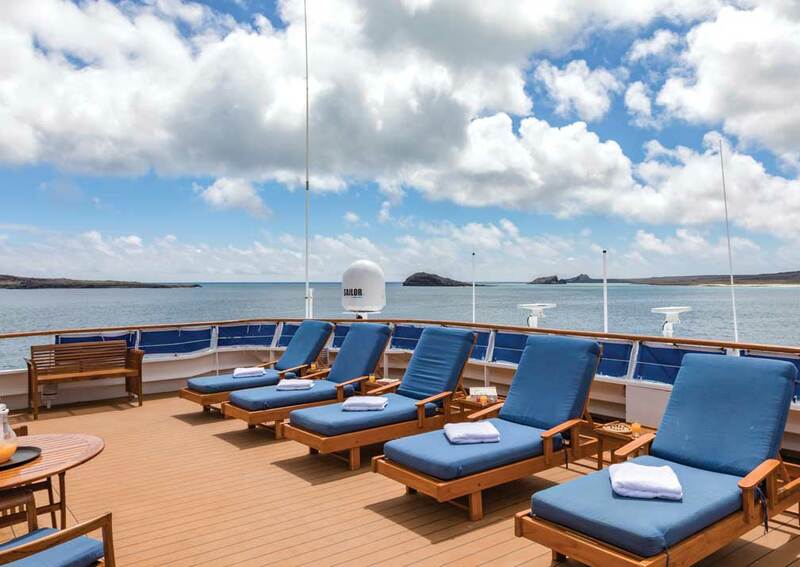 The atmosphere on board is informal and relaxed. There are daily shore excursions, and time to enjoy panga rides, kayaking, paddle-boarding, swimming and snorkelling, as you explore the islands and their unique flora and fauna. 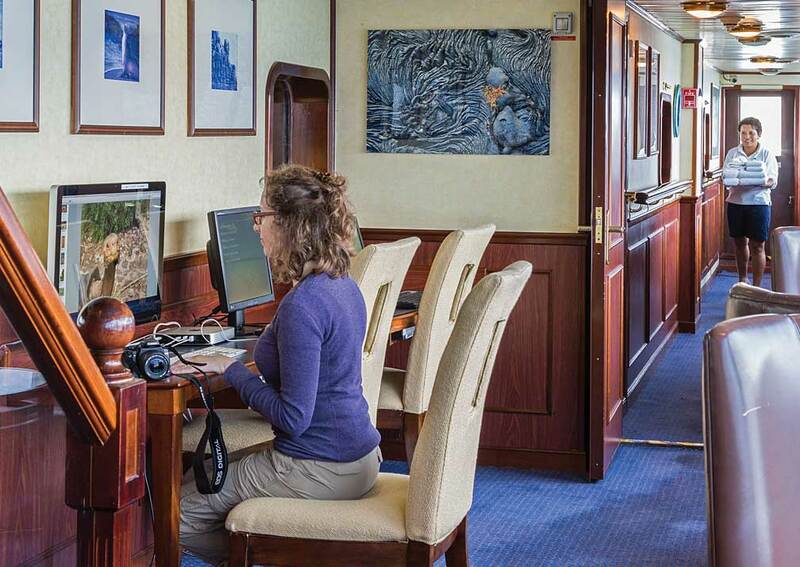 Between times you can unwind in the lounge and listen to talks by the resident naturalist guides and watch film shot by the undersea specialist. 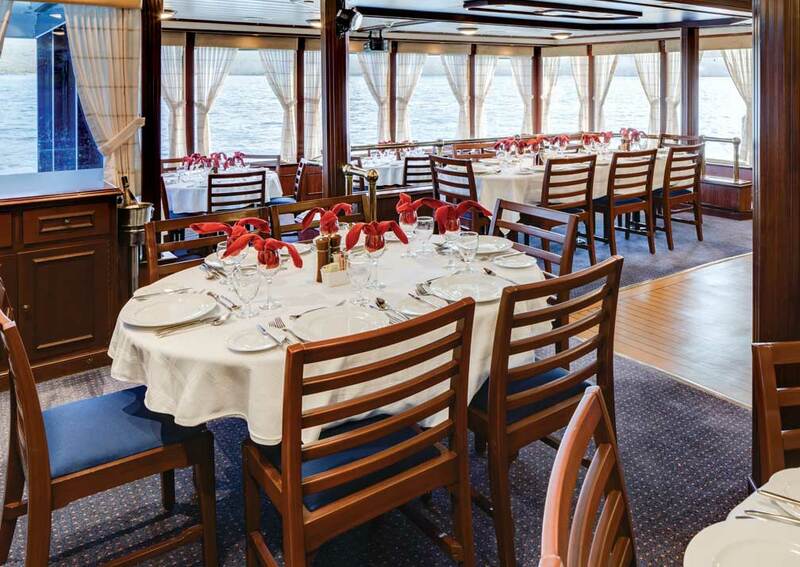 During your time on board you are welcome to leaf through reference books in the library, have a workout in the gym or a soothing massage at the spa, and of course enjoy meals in the dining room. All interiors have climate control for optimum comfort. Islander welcomes families and has activities tailored for children such as searching for wildlife following a series of clues, photography lessons, learning to steer a panga, compiling a journal and collecting points to become a National Geographic Global Explorer. By the end of the cruise the video chronicler has created a DVD of the voyage which you are welcome to buy as a souvenir. These itineraries are flexible and may be varied according to wildlife sightings and weather conditions. 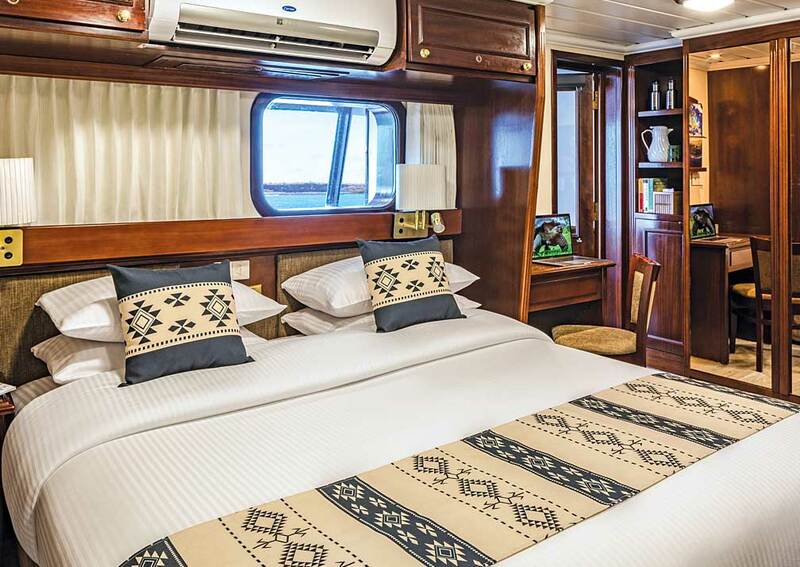 Islander has 24 cabins in total, all with windows and en-suite bathrooms, consisting of 5 categories. 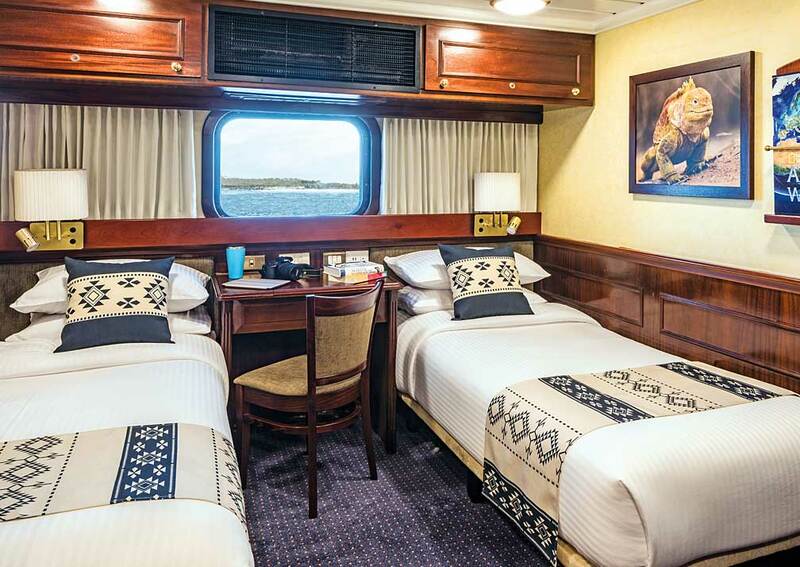 Category 1 cabins can be twins or doubles and have a window, and are located on the main deck. Category 2 cabins are similar and are on the main and bridge deck. Category 3 cabins can also be configured as twins or doubles, and 2 can become triples. They are on the bridge deck. 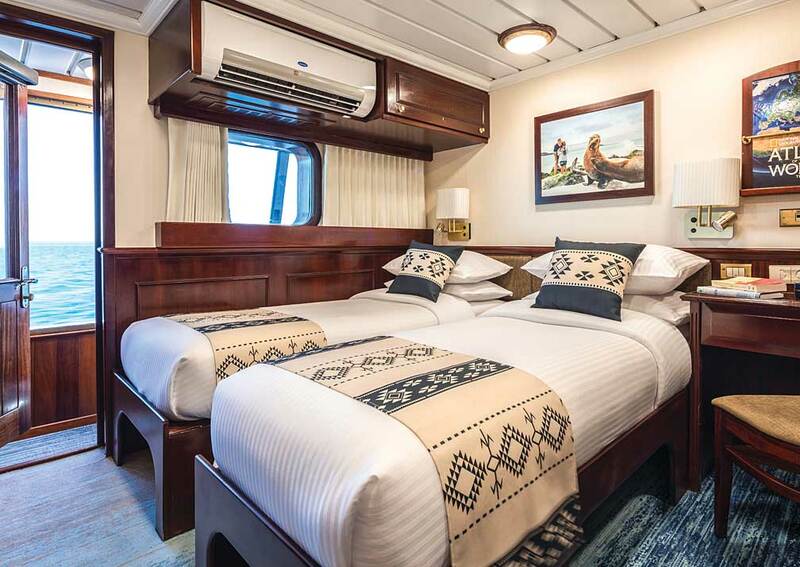 Category 4 cabins are larger, with 2 single beds that can be combined to form a queen bed, and have an enclosed terrace with chairs. 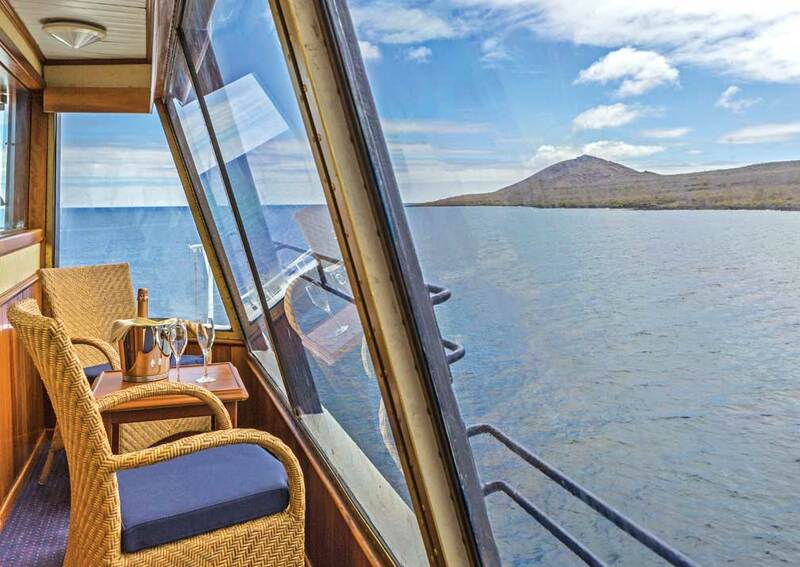 Category 5 cabins are the largest, with an indoor sitting area and desk plus a large glazed terrace with seating. Category 4 and 5 cabins are on the upper deck. Every cabin has air conditioning/heating, Wi-Fi internet access (payable locally), storage space, and an en-suite bathroom with shower gel, shampoo and a hairdryer supplied. Accommodation: 24 cabins in total, divided into 5 categories, all are outside cabins with a window. 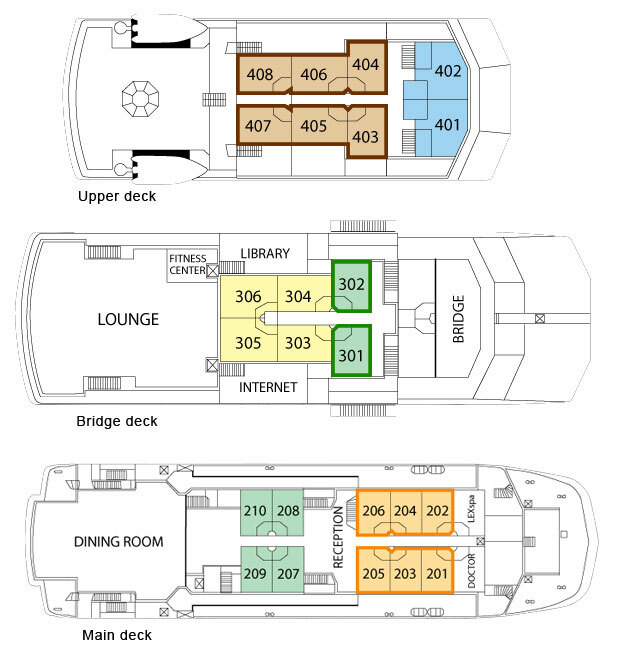 There are 8 on the upper deck (categories 4 and 5) have fully glazed terraces with seating. 10 cabins (2 category 1 and 4 category 2) are on the main deck, 6 are on the bridge deck (2 category 2 and 4 category 3) and 8 are on the upper deck 96 category 4 and 2 category 5). 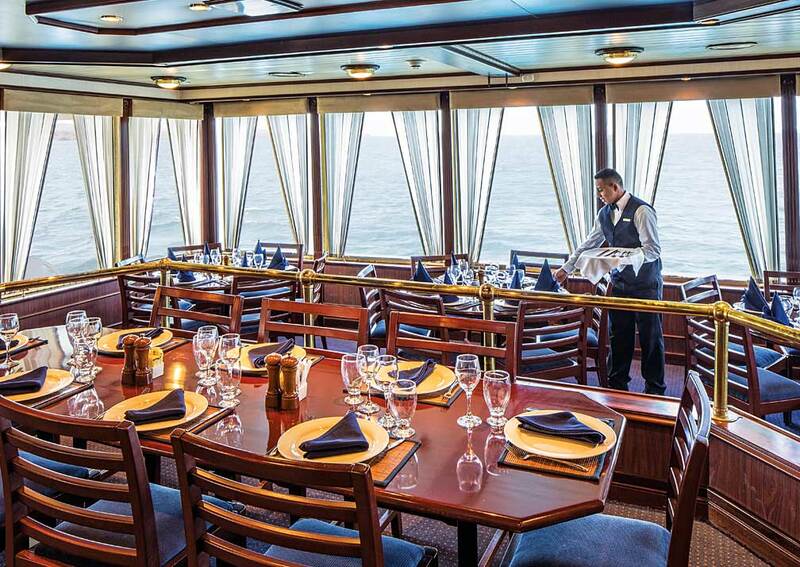 On Board: The main deck houses the reception, spa, gym, doctor’s surgery and, at the stern, the dining room, where passengers eat in one sitting. 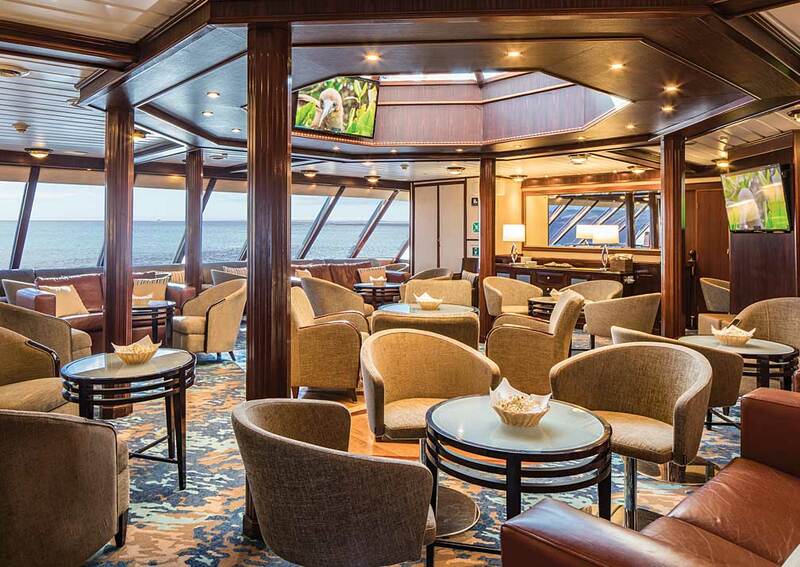 The large lounge equipped with Wi-Fi (pay locally), library and internet room are on the bridge deck. The upper deck has an open deck area. Islander offers a laundry service. Islander carries snorkelling gear, wetsuits, kayaks, pangas and a video microscope for passenger use. Crew: Includes an expedition leader, 3 naturalist guides, a photographic instructor, undersea specialist, wellness specialist and a vide chronicler. There is a doctor on board, available round the clock at no extra charge. Book by July 31, 2019 and there will be no solo traveller premium on single cabins on select 2019 departures. Single travellers will pay double occupancy rates for Solo occupancy in designated cabins/categories. Book by Jul. 31, 2019. Kids credit will be deducted from cabin fare, prior to any additional applicable savings. New bookings only..
Book by Jul. 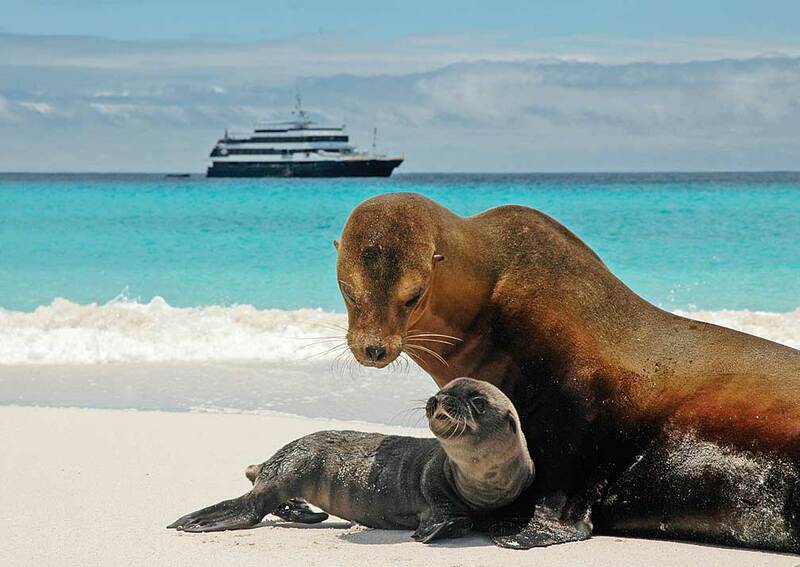 31, 2019 for free round-trip air from Ecuador to Galápagos on select 2019 and 2020 departures. 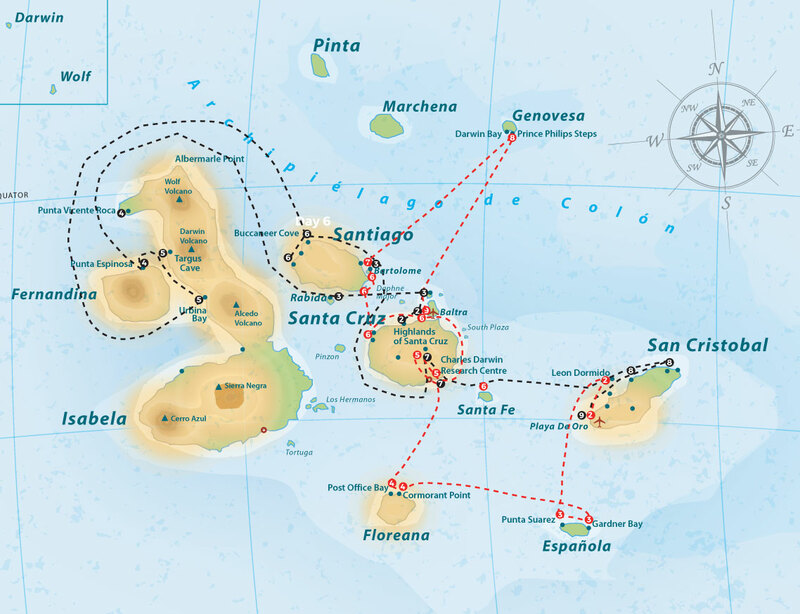 Based on economy group flights booked only through Galapagos Specialist & Lindblad Expeditions. Terms & Conditions: Based on 2 people sharing. Offers are for NEW bookings only and are subject to availability. Some offers may be combined with others (please ask your travel consultant). Includes Ingala, bed & breakfast at hotel and full board on yacht. Excludes international flights, domestic flights, $100 park fees to be paid locally, drinks, tips, expenses of a personal nature and transfers from your international flights.